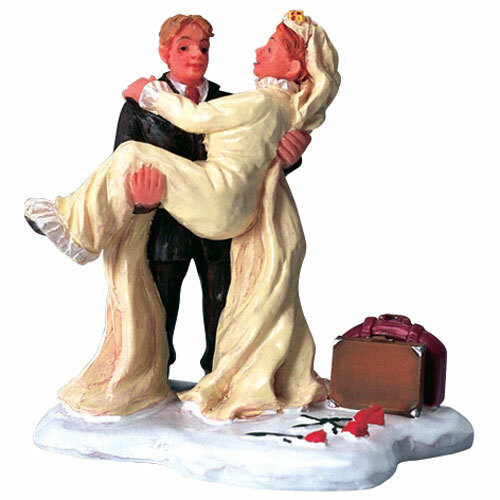 Lemax Just Married Figurine depicts a happy couple in Winter celebrating a truly white wedding while snow is still on the ground. Just Married is a delightful and happy Lemax Winter scene addition suited for placement in a Lemax seasonal Christmas miniatures display. Another popular figurine addition to the Caddington Village catalogue, joining the collection in 2004. Just Married Bride and Groom are hand painted polyresin figurines mounted on a single base to compliment your seasonal Lemax Village display. Good quality great accessorie for church yard .When doing a village each building requires a story to bring it to life.Our church has a nun a vicar a choir and a wedding couple .